It's never too late to brush up on your winter skills—not in Minnesota! One training option is the Clear Roads snowplow operator and supervisor training program, meant for both entry-level and experienced snowplow operators and supervisors. The training materials are available free of charge to any agency, including local and county highway departments. 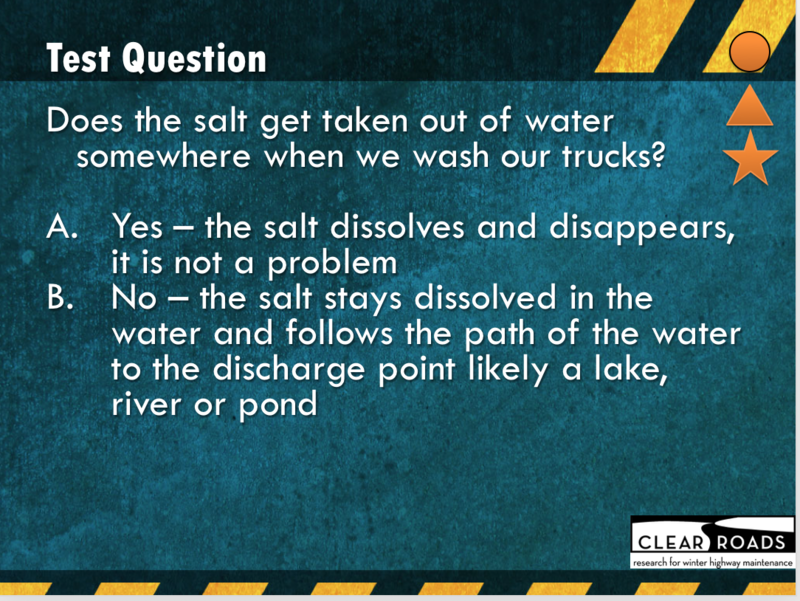 For access to the Clear Roads training materials, email Clear Roads administrator Greg Waidley at greg.waidley@ctcandassociates.com or call 608-490-0552. Answer: B. If you use an outside drain, water goes directly to lakes, rivers, ponds. If you use an indoor drain, it goes to a water treatment plant, then out to a lake or river.